In 2015, the AVO brand underwent a significant makeover. With the makeover, the brand introduced some packaging changes and there was some consolidation of the lines in the portfolio. As a part of the consolidation, two lines under the AVO brand were dropped, these were the AVO Maduro and the AVO Signature. The consolidation left room in the portfolio to introduce new regular production releases, most notably the blends under the AVO Syncro line. With AVO Cigars celebrating its 30th anniversary in 2018, the brand decided to bring both AVO Maduro and AVO Signature back for a limited run. Today we take a look at the resurrected AVO Signature in the Belicoso size. The AVO Signature traces its roots back to the AVO 75, which would be the first AVO Limited Edition cigar released in 2001. Shortly after the limited run of the AVO 75, the AVO Signature Series would make its debut. The AVO Signature uses a blend based on the AVO 75 blend. AVO 75 was originally released as a Double Corona. The Double Corona size would carry over to the AVO Signature, and four additional sizes were eventually added to the line. Without further ado, let’s break down the AVO Maduro No. 2 and see what the cigar brings to the table. The 30th Anniversary blend of the AVO Signature brings back the same blend as the original AVO Signature line. The AVO Signature 30 Years edition returns in three sizes. Each is packaged in ten-count boxes. Not returning for the 30 Years edition are the Small Corona and Lonsdale size. The Ecuadorian Sun Grown wrapper of the AVO Signature Belicoso had a medium brown color with a slight rosado tint. There was some oil on the surface of the wrapper The surface had somewhat of a bumpy surface with some visible veins and visible wrapper seams. The tip of the belicoso had a sharper taper near the cap. There are two bands on the AVO Signature 30 Years. The primary band uses a style similar to what has been seen on previous AVO releases following the 2015 revamping of the band. This band features a white background with red and gold striping on the side of the bands. In the center of the band is a black, gold, and white colored AVO logo. To the right is the text “AVO UVEZIAN” in gold font while to the left is the logo is the text “AVO Signature” in cursive gold font – both sitting on a thick red stripe. The secondary band is a ring that is being used across all of the releases that are a part of the AVO 30th series. The band has an antique white color with an orange pinstripe along the lower edge. There is a large gold-colored 30 in the center of the band. A small gold-colored 1988 and 2018 flank each side of the 30. Using my Credo Special T cutter with the 36 ring gauge hole, I placed a straight cut into the AVO Signature Belicoso to remove the tip. Using a cutter with a small ring gauge allows for taking advantage of the tapering of the cigar and smoking it with a smaller surface area. Once the tip was removed, I moved on to the pre-light draw. The cold draw delivered notes of natural tobacco with a slight sweetness and subtle pepper. I judged this to be a satisfactory pre-light draw. At this point, it was time to light up the AVO Signature Belicoso and see what the smoking experience would have in store. The AVO Signature Belicoso kicked off with notes of natural tobacco, coffee bean, black pepper, and hay. Early on the natural tobacco and coffee bean notes moved into the forefront. Like the pre-light draw, the natural tobacco imparted a subtle sweetness into the flavor profile. At the same time, there was an underlying creamy texture to the flavors. As for the retro-hale, it produced an additional layer of black pepper. During the second third, there was an increase in the hay notes. By the midway point, the hay notes were on par with the natural tobacco and coffee bean notes. The underlying creamy texture of the flavor still remained. By the midway point of the AVO Signature Belicoso, the sweetness had diminished greatly. Meanwhile, there still was a touch of pepper in the background. By the last third, the natural tobacco notes receded into the background, leading the hay and coffee bean notes in the forefront. There were still background notes of black pepper present as well. This is the way the AVO Signature Belicoso came to a close. The resulting nub was slightly soft to the touch and cool in temperature. Overall the burn for the AVO Signature Belicoso performed quite well. The cigar had no problem maintaining a straight burn path. There was a slight bit of unevenness on the burn line, but in the end, this did not prove to be problematic. The resulting ash had a light gray color to it. This ash was definitely on the firmer side. As for the burn rate and burn temperature, both were ideal. The draw to the AVO Signature Belicoso had a good amount of resistance to it. Sometimes when you clip a tip off the Belicoso and smoke, the area where the tip was removed can get plugged while smoking; but there was no such problem here. In terms of strength and body, the AVO Signature Belicoso started out mild to medium. For the first two thirds, both the strength and body remained constant. Around the final third, both attributes kicked it up a notch, just having enough intensity to cross into the medium range. Throughout the entire smoking experience, both the strength and body balanced each other nicely with neither attribute overshadowing the other. 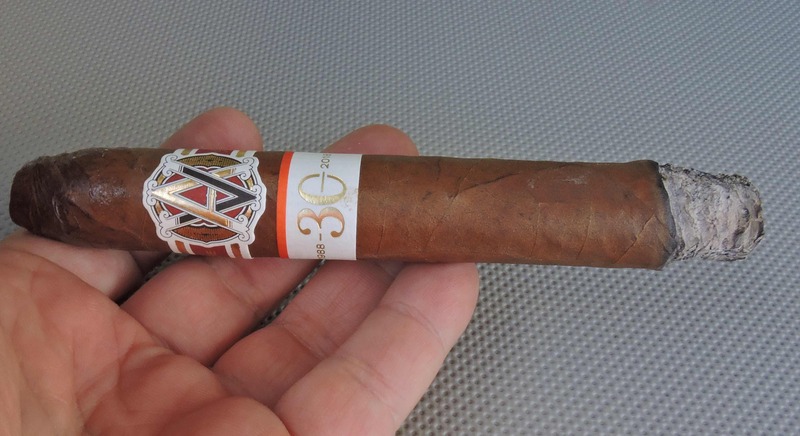 The AVO Signature 30 Years Belicoso is not a cigar that’s going to deliver big, bold flavors. Instead, it’s going to be one that delivers subtle and refined flavors. 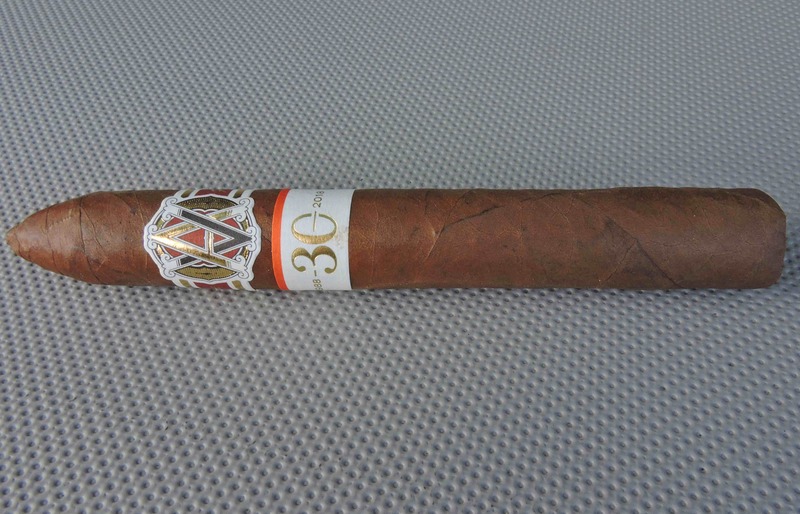 It’s been a while since I smoked an AVO Signature, but I feel comfortable saying the AVO Signature 30 Years Belicoso captures the spirit of the original blend. In the end, it’s a little hard to do an apples-to-apples comparison of the AVO 30 Years iteration of the cigar versus the original because the original ones have more age to them. AVO Signature is a more premium offering in the AVO portfolio and the pricing ($13.20 to $16.20 SRP) reflects that. Still this is a cigar I’d recommend to an experienced or novice cigar enthusiast – particularly one who would appreciate a dialed back cigar. As for myself, it’s a cigar I would purchase and smoke again.